In February 2017, Vietnam launched the e-Visa program to simplify the process of entering the country. Previously, travelers needed to get a Vietnam approval letter and receive a visa on arrival. Now citizens of 46 countries can apply online and get their e-Visa electronically. The process is 100% online – no more embassy visits. The document can be obtained online in as little as 3 business days. It must be presented when boarding your flight and to the immigration officer upon arrival. The e-Visa is a single entry document and is valid for a maximum of 30 days. The e-Visa is a single entry visa. The e-Visa is valid for 30 days from the proposed date of entry indicated during the application. e-Visa holders may remain in the Socialist Republic of Vietnam for a maximum of 30 consecutive days after the initial entry date. Travelers who want to visit Vietnam must have a passport with at least 6-month validity from the planned date of entry. Once the first 30 days have passed and a renewal is needed, e-Visa holders in Vietnam may be considered for a new visa if they are invited/sponsored by an authority, organization or individual in Vietnam, in accordance with the law on foreigners' entry into, exit from, transit through and residence in Vietnam. The applicant’s passport must be valid for at least one month after arrival in Vietnam, and it must have at least two blank pages for the immigration and border control officer. Minors with their own passport must complete a full e-Visa application. Minors aged 14 and under included on their parent’s passport will have to be included on their parents e-Visa application. Applicants are required to carry a copy of their e-Visa at all times during their stay. What is a Vietnam e-Visa? An electronic visa (e-Visa) is a type of visa issued to foreigners by the Vietnamese Immigration Department via an electronic system, providing permission to travel to and enter Vietnam. The Vietnam e-Visa is valid for a maximum of 30 days (single entry). What do I need to apply for the Vietnam e-Visa? What is the cost to obtain a Vietnam e-Visa? 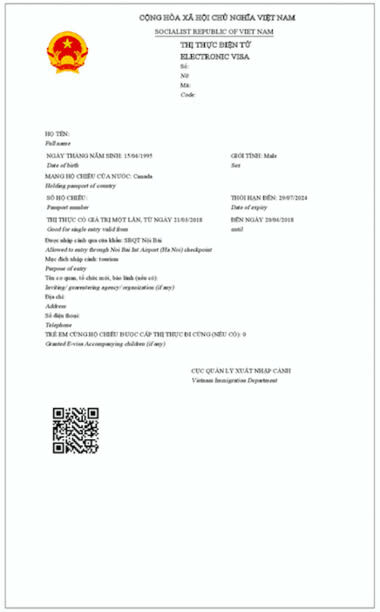 The Vietnam e-Visa costs 25 USD. Additionally, there is a service fee of 20 USD for standard processing. For rush processing and super rush processing the service fee is 30 USD and 60 USD, respectively. The Vietnam e-Visa is valid for 30 days after arrival. It is a single entry visa and allows for a maximum stay of 30 days. What conditions must the applicant’s passport meet for Vietnam e-Visa? Your passport must be valid for a minimum of 30 days beyond the visa expiry date and should have at least one blank page. For example, if you enter Vietnam today and your visa expires in 30 days, then your passport must be valid for at least 60 days. Can Chinese e-passport holders apply to the Vietnam e-Visa? Only Chinese ordinary passport holders are allowed to apply to the Vietnam e-Visa issuing. After entering Vietnam with an e-Visa, you can request that an agency, organization or individual in Vietnam sponsor your stay. They would have to apply for a new visa on your behalf at the Vietnam Immigration Department. Do I need to enter Vietnam on the exact date specified in my e-Visa application? The validity period of your e-Visa begins from the date specified in your approved e-Visa document. You can enter Vietnam on any date within this validity period. I am a member of a flight crew. Do I still need a visa? As long as the trip into Vietnam is related to flight duties, no visa will be required. However, if the entire trip is for personal reasons, a visa will be required. We also encourage you to contact the appropriate department with your airline for more information. How many entries does the Vietnam visa obtain? You can enter Vietnam only once with this eVisa. Which ports of entry permit the use of an e-Visa? Can anyone apply for the visa online? No. Citizens from only a few countries can apply for the Vietnam eVisa, use our Visa Checker tool to see if you qualify! If you want to plan a visit to Asia, then you cannot leave Vietnam out of your itinerary. It is a beautiful country with plenty of beautiful landscapes, breathtaking scenery, and lovely people. While some go there for the cities, more tourists want to explore the wild. And they have what to be amazed of. A trip around rural areas will overwhelm you at times, and the hospitality of the people will humble you. However, before you start planning your trip to Vietnam, you need to know a few basic things that will make your trip a little bit more pleasant. Some research is required before your departure, and this article should help you a bit. The first thing you need to know is that you will be able to communicate with people in English, but more in the urban areas. People in the countryside will rarely know how to speak it, and your chances of getting along are higher with the younger generation. Even so, it is recommended that you learn a few basic expressions before you leave so that you can get around. There are apps you can use, but a pocket-sized dictionary may also help. Plus, do not expect the internet to have the same speed as in western countries, and some regions do not have internet at all. One aspect you need to be careful about is money. In Vietnam, the currency is the dong, and while you may be tempted to make a joke about its name, refrain from doing it in front of a Vietnamese person. However, when you exchange your money, you will notice that the bills are very similar. The 50,000 dong bill is almost identical to the 500,000 bill, which can sometimes make you lose money. We recommend that before you make a payment, you should take a close look at what bills you are giving. Do not expect vendors to give your money back once you make a mistake. Tourists’ money is relatively new in Vietnam, which is why some vendors will come off as greedy. Some will even try to take advantage of you. They will bargain for one price and you can end up paying another. Speaking of bargaining, you are allowed to do it almost everywhere. However, if you have no skills, you should refrain from buying too much stuff. You will get scammed, otherwise. Although a lot of people choose to explore Vietnam with the help of a tour guide, we recommend that you do not buy tour packages. A lot of people are not satisfied with what they get and they end up believing that they would have done better on their own. That is actually very true. It may take some time to create your own itinerary, but as long as you do some thorough research, you should be able to handle the situation just fine. Plus, you save some money that you would otherwise give a guide that is probably bored or too quiet. It is a pity that Vietnam does not educate its tour guides better, but surely they will come to the conclusion that it is in their best interest to do so. As for accommodation, the hotels in Vietnam are a bit pricey. Plus, the breakfast they serve is usually plain. However, one great tip is to search the alleys. There are plenty of hotels in Vietnam, more than you would expect, but if you search the alleys, you will find many hotels that are clean and have better prices. Hotels that are on the main street take advantage of the fact that they are the first thing you see, which is why the hotels in the back alleys have lower fees. One of the things you will like in Vietnam is the food. We have Vietnamese food in the western countries, but as you can imagine, it does not compare to the one made by the Vietnamese themselves. However, there are a few things you should know about it. For one thing, you should eat only from very crowded places. Standing in line may not be your favorite, but since the place is crowded, you know that the cooks leave their burners open all day long. Plus, they always have fresh food. Places that have very few clients will make the food and leave it there. It becomes stale very fast, and you can get an upset stomach. Such an event can ruin your vacation. Also, when you go to a street vendor to buy some soup, make sure that the soup in the pot is slow boiling. While people in service may seem a bit greedy and not very nice at times, you should know that people from areas that are not related to tourism are incredibly lovely. They are welcoming people with warm hearts that will treat you with nothing but kindness. The Vietnamese people are curious, and they want to learn things about you. They have a lot of stories, and they will take from their time to indulge you in them. The contrast between the locals and the service people is considerable, and you should never judge Vietnam by the quality of the people in tourism. Lastly, the best way to explore Vietnam is by train. That is because you can avoid the traffic and the constant honking. You get to see a lot of beautiful places in a calm manner. However, if you need to buy a ticket, do it at the train station. Hotels will always ask you where you are headed next, and they will offer to buy you a ticket. As you can imagine, they do not do it for free. Just buy your own ticket and save some cash. All in all, Vietnam is a country worth visiting. There are some things that you will probably not like, but the same goes for every country in the world. There is no perfect place where everything goes the way you want it.